By its very nature, the future is filled with uncertainty. There’s just no way of getting around that fact. However, living and functioning with uncertainty is the dominant prerequisite to successful investing, especially during your retirement years. As we all know from our “What Should You Pay Attention To” case study in November, the mass financial media does a brilliant job of pushing the panic button on any potential uncertainty by turning it into the “crisis du jour” in order to garner our undivided attention. This will never change and there is no way to control what they throw at us each day. However, what we can and must control is our emotional response to them. As retirees who don’t have huge fixed monthly pensions to comfortably support all of our financial needs for the rest of our lives, we need capital markets to help us maintain our lifestyle in spite of rising costs. What this means is that earning a carefully calculated investment rate of return over our lifetime is not something that would be “nice” to do. It’s an absolute MUST in order to have our assets produce the lifestyle sustaining income we need. If any or all of the uncertainties and “crises du jour” the mass financial media love to put in front of us on a daily basis derail your carefully thought out long term plans, it’s because you allowed what was reported on that given day to outweigh current and long term historical facts. I fully recognize how difficult it is to read and hear what appears to be devastating news on a regular basis. And, how difficult it is to put these ‘events’ in historical perspective, thus allowing you to remain disciplined and rational. With that said, it’s imperative that you adhere to a system of evaluating current events and what they mean to YOU in order to maintain proper perspective. If you don’t, you’re at the mercy of anyone and everyone who shouts the loudest on any given day. This is the reason why we designed The Relaxing Retirement Coaching Program™ which was carefully crafted to empower you to make intelligent, rational, long term planning decisions in all market conditions. 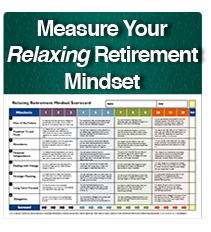 Stay tuned as we delve into each step in The Relaxing Retirement Formula™ so you can maintain the confidence you deserve to live exactly the way you want no matter what is reported today!